← Tap Opens at Noon Friday and 11am on Saturday. It’s a Great Week to come over to Paoli. Wednesday is take your growler to work day. $3 off all growler fills. Thursday OBJ is back for “Blues and BBQ Night” Music starts at 6pm! Friday is Cherri’s Fish Fry starting at 5pm. Saturday is Christmas in Paoli. 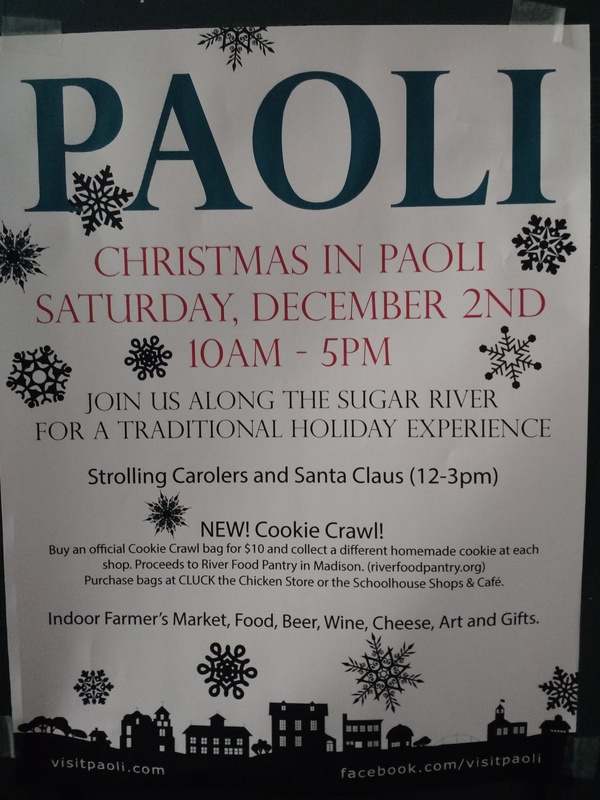 See if you can complete the Paoli Cookie Crawl! Money raised will go to River Food Pantry. Bring the Kids to see Santa! Collect all 12 cookies from the local business’s and reward yourself with a free Pint at the Tap Room and Beer Garden. We will also have an indoor Farmers Market from 11-2pm in the loft. Lots of great gifts for the Locavores! Hats, Stocking Caps, Etched Glass Hop Garden Mugs and Pint Glasses, Shirts, Hop Garden Pickled Garlic and Hops Kits, High Hoppage Merch, Gift Certificates, Growler Club Cards and Case Specials of Nuggetopia and Paoli Gold!